Watch out for sneaky fish. They could be spy bots, working for the Navy. From Rob Carlson, a deeper explanation of Craig Venter & team's synthesis of a complete bacterial genome, and the limits and implications of that achievement. Don't Be Evil, and don't carry stories about UN corruption. Politically Incorrect T.J. Rodgers' politically correct solar venture. The publicists for Rodgers and SunPower have been racking up the placements of late. I think the crowing about a "Moore's Law" for solar is premature, we don't have enough of a track record for market growth and reinvestment to go from a conventional cost vs. cumulative units experience curve to a Moore-like improvements vs. time formulation. It'd be nice, though! Review: Timothy Hornyak's "Loving the Machine"
This book about robots in Japanese culture has been out since late 2006, so I'm coming to it somewhat late. My goal with the book was to fill in background of one of the major non-US innovators in robotics development, both in both cultural and technological terms. The book succeeds admirably in framing the cultural context for one type of robotics in Japan. While beginning with an OED definition of robots inclusive of non-humanoid 'bots, Hornyak self-admittedly spends almost all of his attention on anthropomorphic devices, which he refers to as 'real robots'. In fact, the swath through humanoid representations is so broad that it includes pure fictions such as Mighty Atom (Astro Boy) and Gundam juxtaposed with actual mechanisms. The device succeeds well, however, in keeping the story moving in the direction of the book's central thesis: The cultural backing for humanoid representations of devices in Japan will mesh with actual social needs to drive robotics development in a more anthropomorphic direction than in the West. Hornyak succeeds in building a solid case for this cultural framing of bots in Japan. 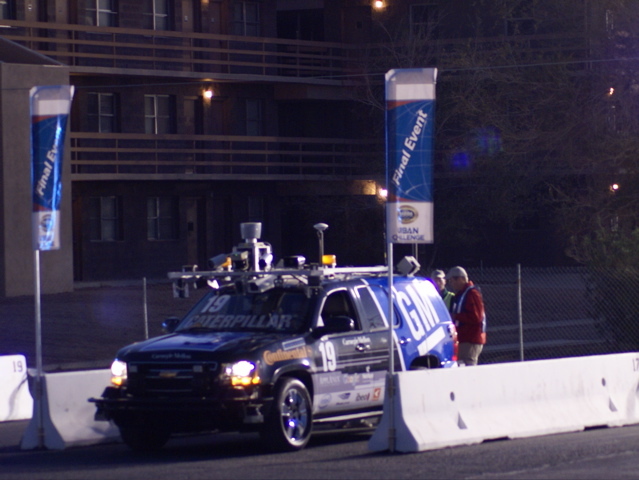 Glenn Reynolds reports, with a nice pic, a sighting of CMU / Tartan Racing's BOSS autonomous vehicle at CES. It's still sporting its vehicle number from November's Urban Challenge. The CES 'course' appears to be just a bunch of traffic cones, little challenge compared to DARPA's multi-bot suburban road race. And yes (indeed!) GM's PR department seems to be getting their money's worth from supporting the CMU team. A Korean container ship has banged into the Bay Bridge. No significant damage to the bridge, but the ship suffered a gash that cut into a fuel tank, dumping 140 gallons of bunker oil into the Bay. That's less than three barrels, fortunately, but the slick drifted over to SF waterfront and a cleanup is underway. That initial report was inaccurate. The actual total dumped was 58,000 - over 1,000 barrels - so we're talking major cleanup. No word on specific cause, but there was heavy fog in the Bay Area this morning. Apparently a harbor pilot was at the helm when the collision occurred, so the ship owners are presumably clear of blame on this. Looking at the crowds at the 2007 Urban Challenge, you'd be forgiven for wondering if DARPA has touched off another of the famous side-effects from its research projects. The event was open and free to the public. 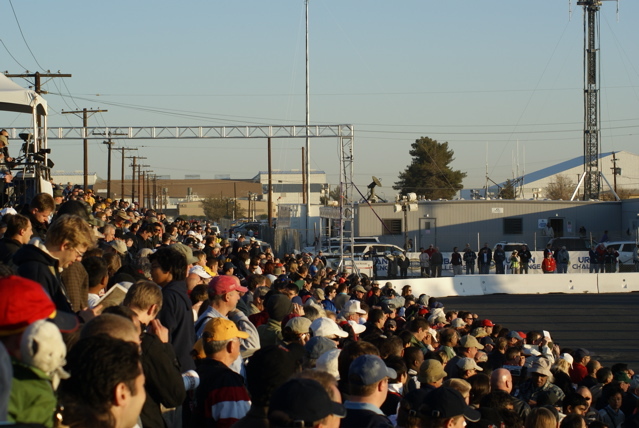 While the teams and DARPA staff were present for the duration, the spectators came and went through the day, making it hard to judge the crowd. But I'd say at least a third and maybe half of the attendees were fans. Some seemed to have found a new kind of southern California entertainment. The Grand Challenges are like NASCAR in some important respects, however. Back in the day, 'stock cars' could be built by shade tree mechanics (and may have spent non-race nights running moonshine). Those days are long gone, and NASCAR is all business with lots of sponsorship money at stake now. That's happening here as well. 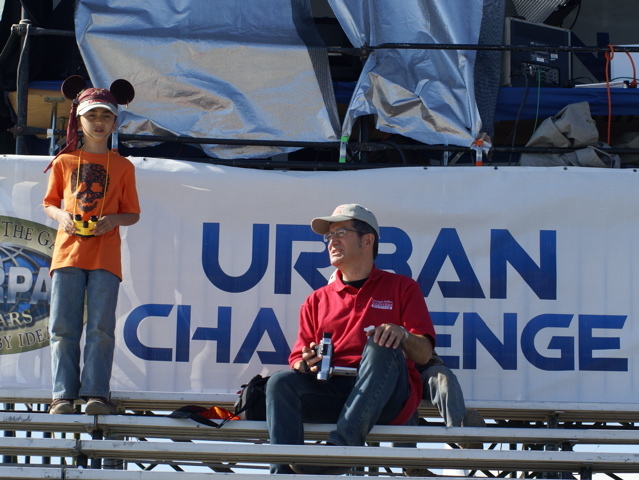 Of the teams that reached the finals of the Urban Challenge, only one - UCF - did so without major corporate sponsorship. The other shoestring efforts that were admitted to the competition fell out quickly during the qualifications. It's a pattern common to technology. When a new area of research or products is broken open, the time and expense required to reach the 'edge' are relatively low. Those who date to the beginning of the microcomputer revolution will remember when anyone with a source of 8008 or 6500 chips and a modicum of funds could knock out a PC wannabe. A software 'product' took a few man-months. What we were actually producing were salable prototypes. The Urban Challenge vehicles are also prototypes, and most teams will readily admit it. Sensors protrude, need to be cleaned periodically, and flake out from RFI, sun glare and dust. Server room rack mounts or Apple's consumer machines crammed into cargo areas are hardly milspec. The uniformed armed forces attendees on Friday were invariably polite, but I'm sure a number of them later had a good laugh considering how these machines would bear up in the heat, vibration and dirt of the sand box. Miniaturization, environmental hardening, integration, testing and on and on. All of these are capital intensive, are required before seeing a return on the investment, and are beyond the charter or means of academic researchers and do-it-yourself teams. The barrier to entry is going up rapidly. I'll start this with a big tip of the hat to DARPA and its director, Dr. Tony Tether (who has one of the world's best jobs). Not only do they push the bleeding edge and come up with clever ways to engage the research community in their endeavors, but they run well-managed events with a flair for showmanship that belies their status as a government and military agency. As an example of the latter, they had arranged for the Urban Challenge webcast and on-site video to be co-hosted by Jamie Hyneman and Grant Imahara of cable's Myth Busters, the current favorite show of the techie crowd. They also have the guts to invite in the world press and the general public while trying something new to the world: Turning multiple autonomous vehicles loose on city streets at the same time, interspersed with human drivers. As Tether said at the start of the program, "If anyone tells you he knows what's going to happen, he's lying." Since that test could likely take every bit of a short November day, the teams, staff and press assembled for their briefings at a chilly and dark 0600. It was a day for old rivals to face off again. The Carnegie-Mellon 'Red Team' had been narrowly defeated in the 2005 Grand Challenge desert race, and were back as Tartan Racing, with their bot 'Boss'. The victors of 2005, Stanford Racing, were also back with 'Junior', based on a Volkswagen Passat. In a remarkable achievement, six of eleven bots that started finished the entire course. Stanford's Junior crossed the finish line first, followed by CMU's Boss and Virginia Tech's Odin. That does NOT mean that Stanford is the winner, as the finish times need to be adjusted for staggered starts and stoppage time on the course. Also the total times will be further adjusted for traffic violation 'tickets' issued for moving and other violations on the course. Any of these three teams could be the ultimate winner. We won't know until 10AM tomorrow who won, and whether DARPA considers the race to have been 'clean' enough to award the big prizes. 'Little Ben', and MIT and Cornell also finished the course, but well out of the running. The day featured bot traffic jams, the world's first bot vs. bot collision between MIT and Cornell, and the attempt of the Terramax robot truck to take out the old air base PX. More as soon as I get a beer and download the camera. Update 11/4/07: Team Tartan / CMU's 'Boss' was declared the winner based on elapsed time, with Stanford second and VT third. None of the three leaders committed major errors, so the race was decided on time. I'm now in Victorville, CA at the site of DARPA's Urban Challenge autonomous vehicle contest. The main event is tomorrow - today was practice day. A good thing, too. The objective was to rehearse the 'launch' and 'recovery' procedures that will send the bots onto the test course tomorrow, where they will interact with each other, with several dozen Ford Tauruses manned by stunt drivers, and likely some of the parked junkers that I spied hidden in a side parking lot. Today started with all eleven finalist bots lined up in their chutes, engines running and sensors rotating. Some of the teams are posting up their video footage of the qualifying runs at YouTube. Start with this one from the CajunBot team and follow the sidebar links to others. Cool to see some of the stuff working, as opposed to the wreck clips from my last post. The 'ghost town' ambiance of the location adds a little something, too. Update: Here's another nice one, from Virginia Tech. DARPA's race for wheeled bots in a city environment is underway at an old air base near Victorville. I'll be driving down for the finals on Saturday, but there's already been plenty of action in the prelims. Of the initial 35 teams that qualified for the Challenge, six have been knocked out (PDF), and two of the favorites, CMU's Team Tartan and Silicon Valley favorites Stanford Racing are through to the finals. The latter team has some nice team photo coverage and bloggage from an industry team member. Friday is practice day for those teams that make it through to the finals, and I'll be doing pit coverage at this blog and at Winds of Change. The finals will feature a live webcast (URL not yet available, check the main DARPA site) including helicopter views of the action, which could be a little hairy - check out the potential final tasks in Section 4 here (PDF). If you want to make the drive to Victorville, there will be a set of bleachers for the public with a Jumbotron display of the webcast. The DARPA Challenges have turned into a major sponsorship and media event since their quiet beginnings. The Victorville area is overwhelmed - my hotel room is all the way out in exciting Barstow. Since there will be plenty of 'who won' type coverage from the MSM, I'll do my best at digging out some of the technology and potential investing background of the event. Update: The cut list is now up to a dozen teams, including the one that had the little problem with the Prius. Six teams are through to the finals, adding Cornell, University of Pennsylvania, Braunschweig (Germany) and Virginia tech to the mix. There are up to 20 slots in the finals, and 23 teams remaining in competition.